This month’s caller is Marlin Prowell from Bellingham. He runs the very successful dances in Bellingham and is a skilled and very well liked caller in the area. 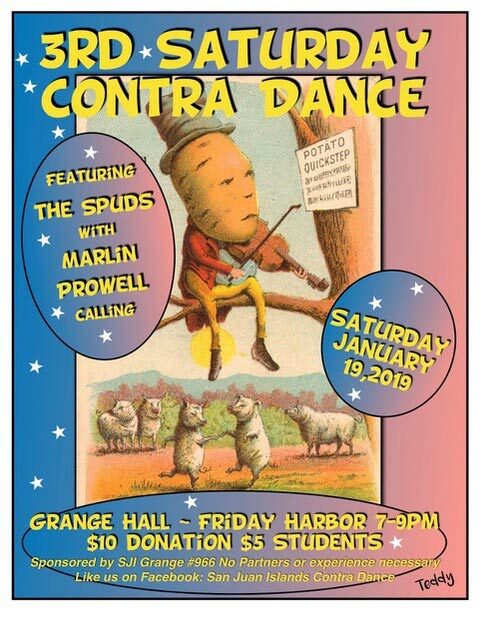 The band this month is The Spuds, our local contra group, all of whom live here on San Juan Island. The band includes Val White on fiddle, Jim Nollman on mandolin, Katy Nollman on banjo and Malcolm Suttles on guitar. We all know and love these folks and they make fine music together. You’ve seen them from time to time playing at the Farmer’s Market too. 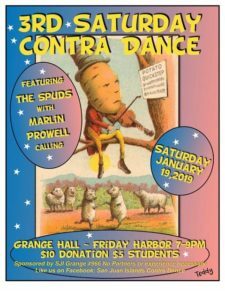 As always, all dances are taught, no partner needed since a feature of contra dancing is changing partners for each dance, and since each dance is taught beforehand there’s no need for prior experience in contra dancing. It’s easy and fun.